All grill chefs are familiar with the scene. A little too much smoke, and then bright flames bursting forth under your grilling surface. The more flames shoot up, the more fat drips, and the charring cycle begins. You do what you can to lower the heat, but the grease fire is going now and lowering the temp is not enough. You start the burger shuffle, moving your meat around the grill looking for an area that’s not on fire yet. You start to remember that having an extinguisher nearby would be a good idea, but you’re intent on saving the burgers, not dousing it with chemicals. To those experienced with this heroic battle against meat dripping flare-ups, you’ve figured out some helpful practices to minimize the impact. Watch your heat. Handle the meat as little as possible. Keep a cooler area on your parrilla grill as a safe zone. These tips are helpful and useful for anyone cooking on an Argentine grill. In addition to some smart grilling practices, there are also some useful tools to help you avoid this common grilling problem. One method to cut down on flare ups and grease fires is to utilize V Groove Grills that accommodate the run off from cooking meats and oil drippings. A stainless steel V groove grill grate, when pitched at a proper angle will funnel runoff juices and fats from your grilled meat away from the meat and into a collection area. The V grooves trap the juices and keep it from rolling off the parrilla grill surface and back onto the coals or gas. A catching trough attachment for the V grooves is a great help as well. A trough can collect juices for basting or simply serve as a better way to catch your grease and help keep your grill surface clean. 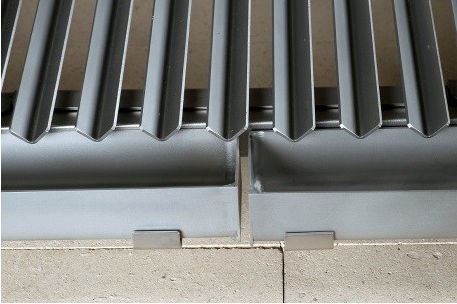 If you plan on using the rotisserie attachment for your Gaucho Grill, the V-groove grates are easily removed to make room for the attachment. Check out our blog about about using the rotisserie on your Argentinean grill for recipes, installation instructions, and more. With all the bells and whistles available on the grills you can buy from the big box stores, strongly consider a grill with a solid practical approach to some of the most basic problems encountered by all grilling enthusiasts. V Groove grill grates are one of those simple and practical tools that can elevate your outdoor cooking experience and save your meal. Watch this video of a Gaucho Grills Insert with V Groove Grill Grates doing what it’s supposed to do. The heat and sizzle is plentiful, yet the grease doesn’t stoke a fire, but moves to the troughs where it will be easy to dispose and clean.